Awhile back someone mentioned the book, Women Food and God, I kind of brushed it off as something I might want to read, but definitely not a must check out now book. 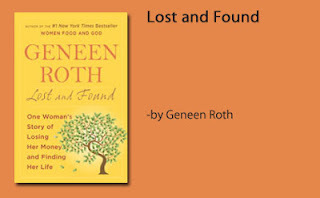 Ironically enough I just finished reading, Lost and Found: One Woman's Story of Losing Her Money and Finding Her Life , by the same author Geneen Roth and I can not wait to run out pick up her other titles. In Lost and Found, we read an honest, self-depreciating, tale of how she lost her all of her money in the Bernie Madoff scandal. I was sucked in and found myself fascinated with how closely we as women reliquish control of our money, feigning it to just be over our head, and trusting it to someone just because it "sounds" like they know what they are talking about. She lost her life savings, thirty years of saving, in one fell swoop. As much as that experience could bury someone into the depths of depression she survived it and learned from it. I never really put any faces to the Bernie Madoff scandal. I just figured it was a bunch of wealthy individuals who lost a portion of their savings, that they were still fine because no one invests in just one place. I was wrong. So many lost everything, their homes, life savings, and their security. The book really brings this fact to light. It personalizes the story. 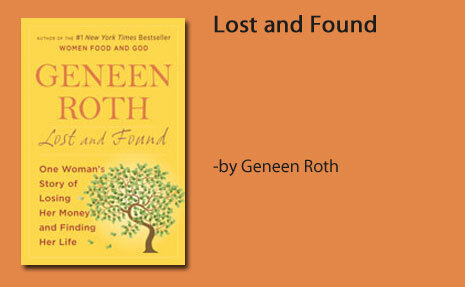 Lost and Found also goes into great detail about our relationship to money. How we put so much into a piece of paper and not enough into our relationships and ourselves. We need to a stop trusting what everyone else says is a good idea to do with our money and begin to take ownership, to take responsibility for our own financial decisions. Lost and Found is a quick read and one I really enjoyed. It not only delves into our own personal relationship with money, power, and the authority and control we give to others. I highly recommend this book. Join the Lost and Found conversation at BlogHer.